Mae Feb 28 2015 4:21 am Yes. He really looks like Seung ri. so Feb 15 2015 5:23 pm Is it just me that whenever I saw him in Bride of the Century thought he looked like Seungri? Playxnn Dec 01 2014 5:59 pm Once I was him, I think it Hyuk VIXX. Their face are same but I don't why I think he look a bit like Hyuk. EunjungLove9 Oct 17 2014 8:13 am He was the same class with Eunjung (Art Major) at Dongguk University. 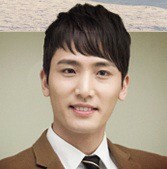 I saw him in WGM Eunjung & Jangwoo (Ep 6). Love his acting..
Marilyn Jul 08 2014 10:36 pm I knew I'd seen him somewhere before! Bride of the Century and now Doctor Stranger. I like this actor.